For restoring distrust in our most important institutions ... The idea of WikiLeaks is scarier than anything the organization has leaked or anything Assange has done because it restores our distrust in the institutions that control our lives. I get on my high horse about Vargas' lies because reporter-editor relationships are based on trust. A news organization can't function if editors must constantly cross-examine their reporters in search of deliberate lies. I'm more disturbed with Vargas for lying to the Washington Post Co. (which—disclosure alert!—employs me) than I am about him breaking immigration law. To run with his latter example, reporter-editor relationships are based on trust, but local contact-US embassy staffer relationships are not? Monsieur Monde is a successful middle-aged businessman in Paris. One morning he walks out on his life, leaving his wife asleep in bed, leaving everything. Not long after, he surfaces on the Riviera, keeping company with drunks, whores and pimps, with thieves and their marks. A whole new world, where he feels surprisingly at home—at least for a while. Carla was not available for comment. Above, the options presented in a Google News search related to Ireland's oldest paramilitary group, the Ulster Volunteer Force. His nearly perfect sense of terrain and geography is marred only by his regrettable conflation of Russia with the Soviet Union, which leads to confusion about battlefield locations, German war aims and Soviet casualties. Jim Lacey has a great column today on the anniversary of Operation Barbarossa, Hitler’s ill-advised assault on Russia. I happen to be reading about the campaign in Andrew Roberts’ so-far great history of World War II, The Storm of War. The "Russia" usage is made several additional times in the post. It's a painfully elementary error, so elementary that one wonders if there's an agenda behind it. We're feeling more assured about Europe already. After all, he's been in his job since 2004 so he's best placed to sort out the mess, right? AP Photo by Virginia Mayo. 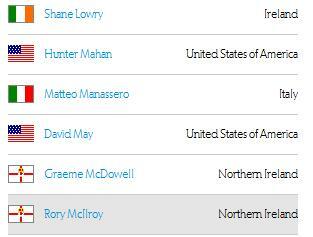 Not as clear as a screen grab would have been, but the US Golf Association uses the "banner" flag for Northern Ireland players. Can the foreign troops take a summer holiday too? (Reuters) Afghanistan said on Sunday it won't be able to address a key International Monetary Fund concern over a looming cash crisis, sparked by a corruption scandal at a failed bank, for more than a month because lawmakers are on holidays. It's an interesting account of the lineage from David Feherty and Darren Clarke to the championship runs of Graeme McDowell and Rory McIlroy and reading it prompts the question about which of the identified factors are different from those that prevail in the Republic. But anyway. A version of this special report appeared in print on June 16, 2011, on page B17 of the New York edition with the headline: Small Nation With an Outsize Presence. Someone thought better of the description of NI as a nation. Dublin faced the same predicament as Reykjavik in 2008, but it responded with a blanket guarantee that turned Irish taxpayers' money into collateral for Irish bank debts. Rating agencies and so-called experts hailed the move at the time, in part because Dublin had the euro and the mighty German state vouching for its credibility. 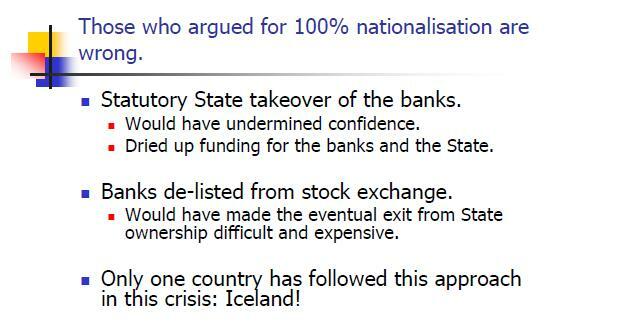 But Iceland's experience of botched government takeovers and private-capital flight has also played out in Ireland—only much more slowly and, arguably, more painfully. The crucial difference between Iceland and Ireland is that Icelandic taxpayers relinquished responsibility for their banks' bondholders, while their Irish counterparts are on the hook for their banks' crushing debts. Even worse, we may not have seen the full scale of the Irish banking system's losses, given that it remains on government life support. The way to reconcile the arguments is to note that Ireland had better circumstances in 2008, but made worse decisions. It's not yet clear that official Ireland knows that. Following a tip-off by Bahrain-based UN office, legal measures have been taken today against three women who entered the UN premises after the official work time and refused to leave when asked to do so, the Director General of the Capital Governorate Police Directorate said. A police report has been written about the incident which is considered as a crime punishable by the law, he added. The three women were intending to mount a hunger strike in protest at detention of political activists. UPDATE: The New York Times has a good tracking of the events. Also, the UN has produced a nicely on-point letter matching what the Bahraini police would have needed to break up the protest. How convenient! The Telegraph doesn't annotate this part of the note, so who is Lou Suzman? Well, it appears to be a mis-spelling of Louis "Lou" Susman, the current US Ambassador to the UK (appointed by Barack Obama) and a former senior executive with Citibank based in Chicago, but with no previous obvious connection to the UK in general and Labour in particular. [note: here's another Telegraph article that identifies Susman as such but doesn't dwell on it]. So why way back in 2005 did he make it to Ed Balls' premature plan for a Gordon Brown-led election campaign? One possibility comes from the fact that the papers make clear the level of infestation of American pollsters suffered by New Labour. They may have been suggesting names of their favourite US bankrollers for the use of the Brown team. It's not clear if it went anywhere. The Iceland versus Ireland debate is back on. The above is a slide from a presentation that the then Irish Minister for Finance, Mr Brian Lenihan (RIP) delivered in February 2010. Leaving aside the straw man version of what opponents of Ireland's banking sector policy were arguing for, the attitude reflected in the slide is revealing. 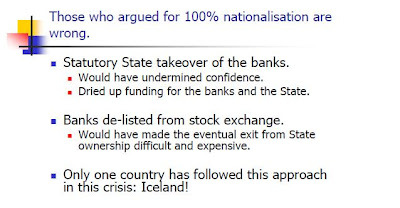 Only a crazy messed up place like Iceland tried taking over the insolvent banks early on, and if we had tried it, there would be no funding for the banks or the state. Fact: Iceland just sold sovereign debt at a 5 percent yield, which is better than Ireland's interest rate under its IMF/EU program. And the Irish state is about to be a majority owner in all its banks. Poor old "Iceland!" Can we have what they're having? Item 1: BEIRUT – The existence of a blogger who claimed to be a Syrian-American lesbian came into question on Wednesday after a woman in Britain said photographs circulating on the Internet were of her, not the blogger supposedly in Damascus. A representative for Jelena Lecic said the London woman first learned her likeness was being used on the Facebook account of a blogger known as Amina Arraf when her photo was linked to article about Arraf in the Guardian newspaper on Tuesday. Item 2: PARIS – Syria's ambassador to France said Wednesday that someone impersonated her and announced her resignation on French TV amid increasing uncertainty about her country's future. The apparently false resignation raised questions about how a respected French news channel, France 24, might have fallen for a hoax. France 24 said Wednesday that it is investigating that possibility. But the meeting, which an administration official said lasted just 15 minutes, underscored how skittish Washington is about appearing too close to Manama as Mr. Obama seeks to use his administration's diplomatic and financial muscle to help advance the "Arab Spring." A number of Bahraini human-rights campaigners criticized the White House's hosting of the royal, arguing it could provide political cover for the ruling Khalifa family to continue its crackdown. No photographs of the meeting were released, and the White House offered no platform for Mr. Obama or Prince Salman to deliver remarks. U.S. officials were so concerned about keeping Mr. Obama at a distance from the crown prince that the meeting was not even on the president's daily public schedule, as is customary. Above, a photo on the Bahrain News Agency website story about the meeting. It's a challenge to find an entity more amoral and mercenary than the "realist" foreign policy types looking the other way as Syria and Yemen implode, but step forward the ruling elite at international sports organisations as Sepp Blatter demonstrates the gulf between public opinion and bureaucratic manoeuvering and the International Automobile Federation shamelessly reinstates the Formula 1 Grand Prix in Bahrain. It might be time for the people who actually generate the cash upon which this parasite class lives -- the soccer players and the car drivers -- to make their views known.